Books and why we love 'em. Tasha is known for her witty dialogue, period detail , attention to historical detail and her ability to keep readers on the edge of their seats with her romantic suspense. Her work has been nominated for numerous awards and has been translated into more than a dozen languages. She and her husband, novelist Andrew Grant, divide their time between Chicago and the UK. 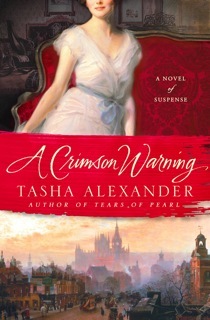 Her latest, A Crimson Warning, has just arrived at book stores. This novel brings her popular protagonist Lady Emily Hargreaves back to high society in Victorian England, where she will join the Women's Liberal Federation in the early campaign to win the vote for women while she must uncover the identity of a vandal who is threatening to reveal scandalous secrets. There’s nothing more magical than when you realize you’re reading one of Those Books. One you know you won’t be able to put down, one you know you’ll never forget, one your friends will grow tired of being told they have to read. And one you know that you’ll never be able to read in the same way again. Books change. At least I think they do. As the always-brilliant David Mitchell says in Number 9 Dream, “A book you finish reading is not the same book it was before you read it.” This is why there are some books that languish on my shelves for long periods of time while I Pleasure Delay. Just knowing the new (ok, not-so-new-anymore) Michael Cunningham is sitting there, waiting for me, makes me happy. Once I read the not-so-new-anymore Michael Cunningham, it may or may not prove to be one of Those Books, but regardless, it will have changed. And if I read it again, it will change even more. 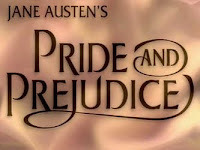 When I was ten years old, I read Pride and Prejudice for the first time. I loved it, but was utterly flummoxed when Lizzy turned down Darcy’s first proposal. A BOY LIKED HER! Did she not understand this rare and mysterious event might never happen again? Sure, he was a little difficult, but he had some qualities (Pemberley) that deserved careful consideration of their own. Lizzy’s decision baffled me. I was filled with relief when she did agree to marry him, and as soon as I’d finished the book, I set to work making paper dolls of all the primary characters. My Lizzy never turned down my Darcy. Since then, I’ve reread Pride and Prejudice more times than I can count. It’s the Comfort Book equivalent of macaroni and cheese or mashed potatoes. But as I got older, the way I evaluated the story changed. In college, I rejoiced when Lizzy turned down that arrogant, pretentious twit, Darcy. High time he got what was coming to him. Later, I came to see that neither Lizzy nor Darcy was without significant flaws, and I could understand both of their positions. My emotional reaction to the book altered as my own circumstances and experiences formed the way I think. is probably why, now, I give such careful thought to when I read certain books. But it’s impossible to always pick the right time to read the right book. That’s part of what makes finding Those Books so utterly and completely delightful. You can’t plan it, and you can’t ever have quite the same experience with even the same book again, which is a bittersweet fact that stings me every single time I realize I’ve found one of Those Books. I can read them again and again, but it will never be quite the same as that first time, when the story and the writing took me by surprise and enchanted me. …she has to lose her pre-Copernican view of a universe revolving around herself. Books don’t offer real escape, but they can stop a mind from scratching itself raw. Lying’s wrong, but when the world spins backwards, a small wrong may be a big right. Hi Tasha, nice to see you back! How about GONE WITH THE WIND? I can remember hiding that one behind a textbook in school because I had to finish it right then! Lucy, oh yes! I loved GWTW. There was a period of time when I'd read it, get to the end, and start right back over. A Suitable Boy (Vikram Seth) - a huge book, and even then I didn't want it to end. Dostoyevsky's The Idiot. The world doesn't have enough Myshkins. I had a similar experience with THE SCARLET LETTER, which I read when I was 13 because - don't laugh - I thought there would be dirty bits in it. (Needless to say, I was gravely disappointed.) At the time, I sort of liked some of the descriptions of the woods and the pilgrim village, but I couldn't make any sense of the relationships. Reread it when I was in my 20s, and was amazed. It was like it was a whole different book. My rereads that always yield something new? The Inferno. King Lear. 19th century poetry. And anything by Lois McMaster Bujold. Your books sound fascinating! I'll look for them at an independent near me. I'm in total agreement about both PRIDE & PREJUDICE and GONE WITH THE WIND. I read them at about the same time during high school--going through a sappy-boy phase if I remember correctly. And let's not forget REBECCA, which is my #1 comfort book. Great to have you here again, Tasha. The first book of my childhood to completely possess me was The Lord of the Rings. I've re-read it many times since and it never fails to evoke powerful emotions in me. Tasha, thanks for joining us. Great post. I've been thinking about it all morning. My perspective on P&P changed on re-reading just the way yours did. But I'm thinking more about the books that I knew from the first page were going to join the ranks of The Books, the books you don't want to finish, the books that ravish you, the books that make your world a little different. A.S. Byatt's Possession. The Shadow of the Wind by Carlos Ruis Zafon. Now reading Kate Atkinson's Case Histories, which I think may join those. I have Cloud Atlas and A Suitable Boy on my to-read shelves. Need more time. But aren't books glorious? Tasha, you read P&P at 10? I might have started but I could never have gotten through it. At ten I was still reading the Oz books and getting started on Anne of Green Gables. I remember hiding Gone with the Wind in 8th grade, only Miss Diebold noticed and took impounded it. My parents, old Lefties who never censored any books or movies, were amused and annoyed (with her). I'm putting A Suitable Boy and Cloud Atlas on my book list too. I've gotten caught up in the YA trilogy The Hunger Games. And I don't even like Sci-fi, but it's TAKEN OVER MY LIFE. So want to get back where I belong. The PAST. Shadow of the Wind definitely is one of them, Deb - but right now I am (and have been) totally and utterly bewitched by A Discovery of Witches! Thanks, Tasha, for inviting delicious memories of enchanted reading. I think of WINTER'S TALE by Mark Helprin. "Pleasure Delay" is right -- In my To Read Again Soon Stack, I've got Chandler and Highsmith books. And REBECCA. I love kids' books and the sci-fi story ENDER'S GAME is one of Those Books for me. I love hearing what books make the grade for all of you. And so grows my To Be Read Pile of Untenable Proportion. And Avi, I LOVED Mark Helprin's A Winter's Tale. Where the hell is my copy, I wonder . . . Thanks for the reminder. Such fun to see what books people love. I've reread it several times, but I wish I could go back to my virgin experience with THE SECRET HISTORY. There's something about the small college, the strange closeness of the group, and the insecurity of the narrator that creates a magical blend. And I love the ending.